You may have noticed that some of our footballers have been sporting moustaches recently. 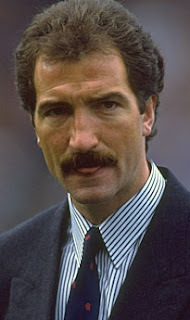 This is not some bizarre tribute to the perfectly groomed Graeme Souness but part of Movember, an annual campaign to raise awareness and funds for prostate cancer. Danny Fox, Gary Caldwell, Paddy McCourt, Kris Boyd and Allan McGreggor have already signed up. So to, with the backing of the Scottish Sun, have Billy McNeill and Souness himself. All 22 players in Morton's clash with Partick Thistle on Saturday were in various states of hirsuteness. And, to prove anyone can get involved, legendary 'tache wearer Jocky Scott has gone clean shaven. Visit the Movember website for more information or to get involved.